Was thinking about Orwell's use of rectify. Was he acquainted with the technical meaning? Hard to tell. His career is all about words and culture; no indication of anything like Signal Corps in his army service. He grew up in India, so rectified butter = ghee was the more likely source of the metaphor. In any case, the electronic Rectifier is a powerful analogy for the process he described. Showing a simplified power supply or detector circuit. Input (reality) is a complex waveform. 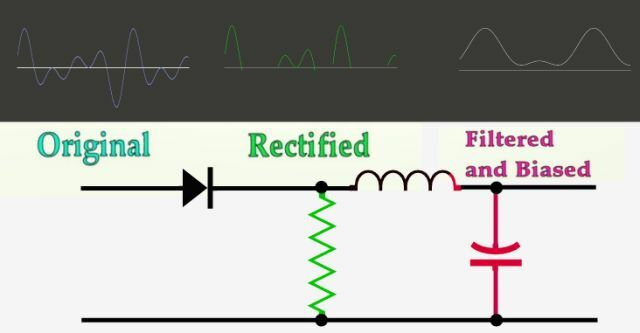 The rectifier grabs only one side of reality, then the filter drastically simplifies the wave, remaining strictly on the 'correct' side. Rectified and Filtered info, as provided by modern media, is purely one-sided and purely predictable. Anyone can write the media story on any event with 100% reliability. We know which side of the wave will pass through the diode, and we know which frequencies will be favored by the filter. Looking deeper, a contradiction appears. Life is diodes. Not just the one-way part but the whole conductance curve. The silicon diode responds to the difference in charge between its ends. When the charges gathered at its left end exceed the charges gathered at its right end, the valve starts to open. As the difference in available charge grows, the flow increases. But this increase is NOT linear. In a simple resistor, doubling the difference in force doubles the flow. In a diode the pattern is tanh, with a sharp threshold around 0.6 volts or 600 millivolts. Below 600 mv, no flow. Above 700 or so, complete flow. Cells also rely on one-way valves in their walls to admit good stuff and expel waste. A neuron responds to the difference in charge between its ends. When the charges gathered at its synapse exceed the charges gathered inside, the valve starts to open. As the difference in available charge grows, the flow increases. But this increase is NOT linear. In a simple resistor, doubling the difference in force doubles the flow. In a neuron the pattern is tanh, with a sharp threshold around 0.06 volts or 60 millivolts. Below 60 mv, no flow. Above 70 or so, complete flow from the axon. Most multi-celled animals have one-way digestion and one-way movement. Move forward, bring in food at the front, digest, leave waste behind. Apparent contradiction: Since life is all about rectifiers, why shouldn't media and history also be rectified? Why is one-sidedness bad in this one situation? Solution: Media and history WILL always be rectified. Good or bad is a moot point. In fact their predictability is the SAVING GRACE. A more subtle aspect of all nervous systems PROTECTS us. At all levels, from the retina and cochlea up to the mysterious cognitive processes, nerves are HIGH-PASS FILTERS, CHANGE detectors. We REJECT sameness and SEEK sharp differences. The perfect predictability of modern "news" thus guarantees its rejection by our input filter. We may keep the radio burbling all day, but we know what's happening at every moment so it doesn't get beyond the cochlea unless we detect something truly different and new. As "news" gets more and more predictable, we ignore it more and more perfectly. Smart propagandists know how to fake newness and break rhythms, but we soon learn to reject each new trick. It's a losing battle for the propagandist.